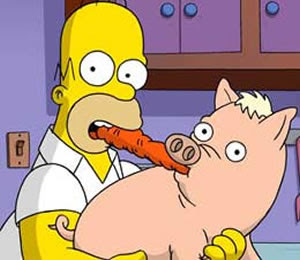 Homer: Wow. I'll never drink another beer again. Woman: He's got the soul of a poet. Barney: Thank you. Your very kind. Woman: Excuse me. Did something crawl into your throat and die? Hans Moleman: I'm Hans. Drinking has ruined my life. I'm thirty-one years olllllllddddd! Homer having to pee badly: "You wouldn't happen to have a bathroom in there?" Leonard Nimoy: No! (Grabs Krusty and pulls him back in) The world needs laughter. Homer: SO LONG Stink Town! Leonard Nimoy: A solar eclipse; The﻿ cosmic ballet goes on. Passenger﻿ next to Leonard Nimoy: Does anybody want to switch seats? Leonard Nimoy: My job here is done. but.. you didnt do anything..
Mrs. Krabappel : Gosh I never got my 6% interest back in 1988. Marge: It's Death! I recognize him from Fortieth Birthday cards! Squeeky voiced teen: um, i dont think he's coming back..
Homer: I'm not normally not a praying man, but if you're up there, please save me, Superman! Ralph Wiggums: "I'm a Fatality!" 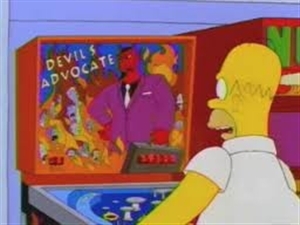 Homer: Marge, might I play Devils Advocate for a moment?